but at least there were doughnuts for after's! Captain Baker gallantly stepped up in goal, with K Jeffries making a very welcome appearance to help us out too. Having just about navigated South Mimms roundabout, we now faced a new challenge as we had been requested to bring our away kit to the match, and both teams now sporting combinations of red and black with white trim. This was going to be a match that required very quick sock identification.... (plain black vs green and black stripes....). The first few minutes went well, until a free hit inside the 25yard line just clipped a defensive stick inches outside the D, was pounced on by a stray forward and deftly slotted into the far corner of the goal. A bit taken aback by the early score, S&S managed to regroup, and fought our way back into the game. The first half was hard, hot work, with breaks by Potters Bar just cleared in time, and hard work by our midfields and forwards edging closer and closer to success. On the halftime whistle PB were awarded a short corner, and with staunch defender Croft temporarily off the pitch walking off an injury, Cook-Abbott was unexpectedly promoted to the back line, successfully pressuring the PB shot taker and taking us to half time at a hard fought 1-0 down, and still plenty to fight for. Something happened at half time (readers of a nervous disposition feel free to stop reading here... or cut to the postive where we were liberally supplied with iced dougnnuts and hallowe'en cupcakes back at the clubhouse). Potters Bar came out strongly from the start, very strongly. With a goal slotted home very quickly from the retake. And another. And another. All their front line showed their speed, strength and accuracy in being able to pick up the ball and strike dangerously from inside the D (safe play, just dangerous for the scoreline). Heads dipped briefly at the thought of just how many minutes of the match remained, but, driven by Cook, we regained some of our composure and began to put our own play together and try to return the pressure. But now PB had the bit between their teeth, launching break after break of flowing, team hockey that the tiring legs of midfield and defence just could not thwart. 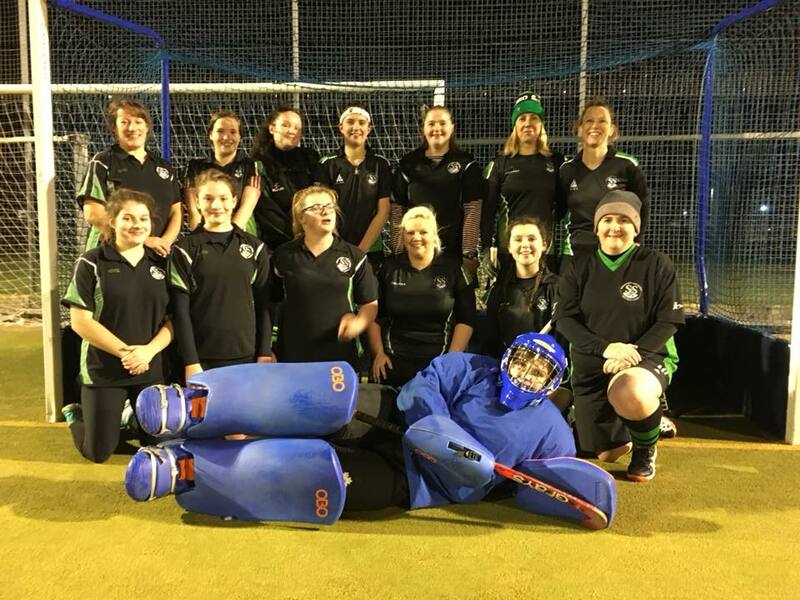 Another goal or two went in, despite the outstanding efforts of keeper Baker, who picked a disheartening match for her debut in goal - we have rarely faced such a formidable strike force in recent seasons! In the last few minutes of the match, Jeffries' hard work finally paid off with Kelly connecting with a hard-earned cross to put us on the scoreboard. PB were not letting us play Last Goal Wins, and had to have the final say, with another goal (or two) in the final minutes, topped off with a deft flick/lob at short range which went through/over the heads and shoulders of at least 3 defenders on its way to the back of the net. Despite the scoreline there were plenty of positives to take from this match. Huge thanks to Jeffries for agreeing to play, and for lifting our play a gear every time she stepped on the pitch, to Cook for not allowing us to get our heads down, and wearing out the opposition defence whilst creating our strongest chances. Kelly and Ralphs also stepped up their game this week, showing new strengths, confidence and ability - Ralphs linking up particularly well with Cook-Abbott down the right for some of our stronger passing passages. On the left Davies and Higginson-Carter battled hard, linking well with the centre players to battle the ball up the pitch. Croft had a stalwart match as always, linking our play together and launching our midfielders. West (Chucas) and Angell (S) both had the difficult task of trying to control the flying forwards, and managed to outwit them on numerous occasions with some deft tackling. Sweeper Wainwright had a decent first half and somehow got Man of the Match (genuinely surprised, but thankyou!) with a few last ditch tackles and occasional successful clearance and hit out. Keeper Baker had an outstanding first match, saving many more than went past, and was faced with 2-3 on 1 on far too many occasions (although falling over the goalpost and not being able to get up may have been a giveaway that she wasn't used to the kit...).